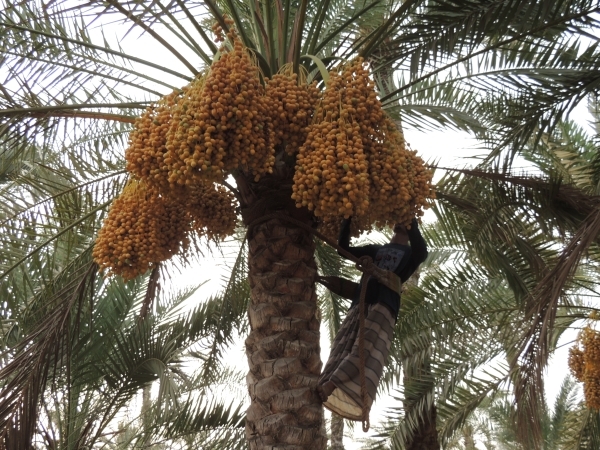 The heat of summer brings date harvesting season in Oman. Palm trees around the country are heavy with produce, shops and markets are full of juicy delicious dates. If you haven’t had one yet, I suggest you do so promptly. 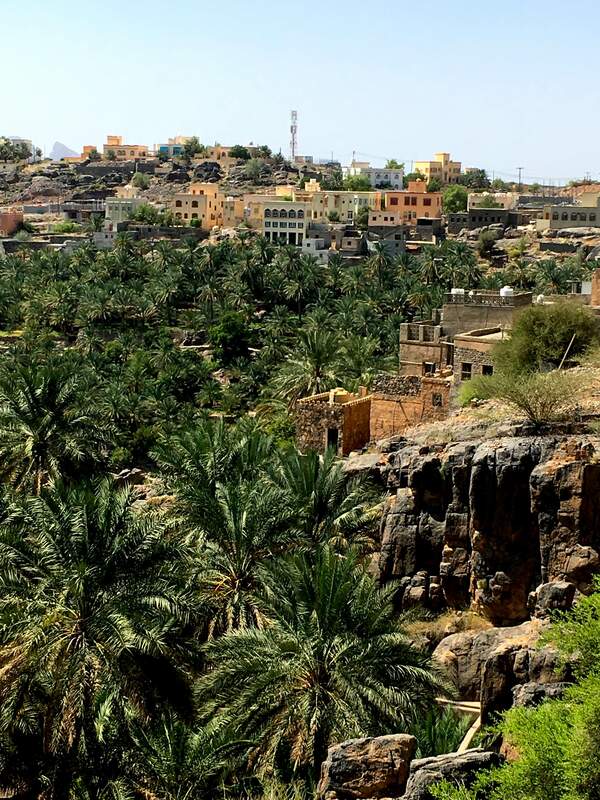 Date farming is of great economic and social importance in the Sultanate. 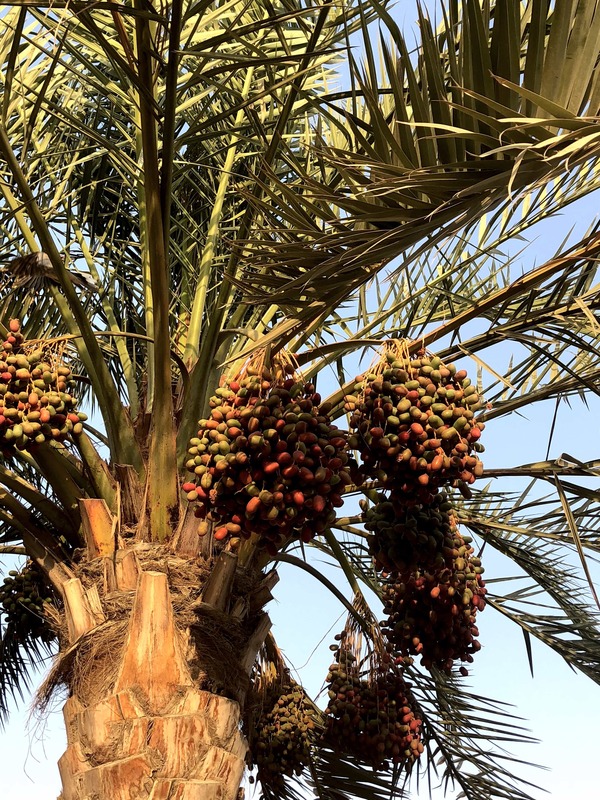 “The date palm,” according to research done by Rashid Al Yahiya and M. Mumtaz Khan with Sultan Qaboos University, “is the primary agricultural crop in Oman, and it constitutes 80 % of all fruit crops produced and 50 % of the total agricultural area in the country,” making Oman the 8th largest producer of dates in the world. Traditionally, village date farms were family run and a palm tree would often be planted for the birth of a son. This tree would grow with him and provide nourishment throughout his lifetime. 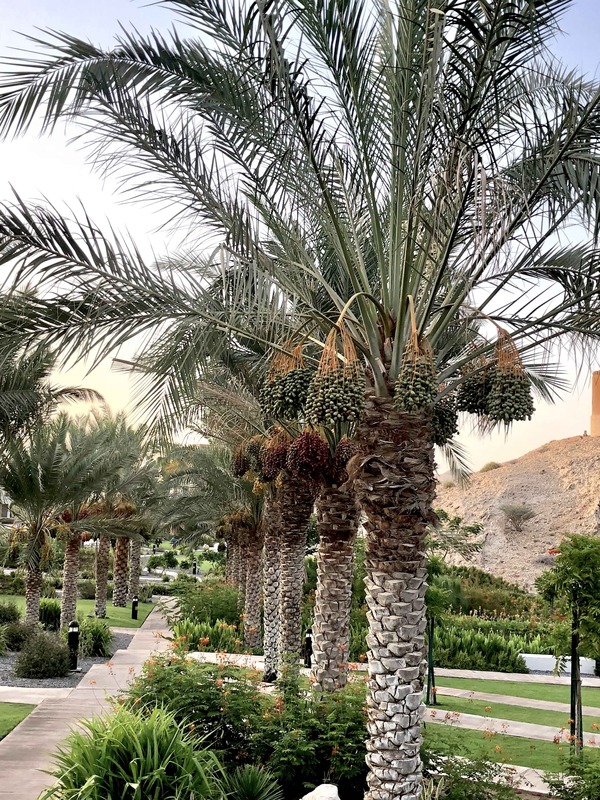 Given Oman’s high urbanization rates, palm tree owners may no longer live in the village – but date farming is still very much a family affair. Mohammed Sabahi lives in Muscat with his wife and children, but owns a date farm in his village, Nizwa. His father, who still lives in Nizwa, is responsible for the daily running of the farm. Mohammed graciously agreed to share with me the basics of date farming throughout the year, and the importance of family in growing dates. 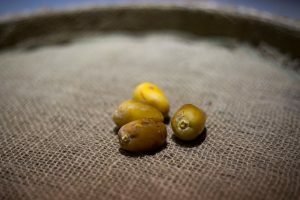 In order to understand date farming, Mohammed stated, it is important to look at the whole life of dates, starting with the pollination process. There are male and female palm trees, he explained, and from January to March, the date palm flowers open in the dry northern winds. When this happens, Mohammed continued, the farmer will climb the tree, cut the flowers from the male tree, and split them. The male flower is put on the female by hand. The palm flowers will not open all at the same time, so pollinating one tree may require this labor intensive process to be repeated two-three times. The female tree needs exactly the right amount of pollen applied, at the right time, for the process to be successful, so the farmer needs to know exactly how many male flowers to put on each individual female tree to pollinate it. This knowledge, shared Mohammed, is passed down from father to son; a father will teach his children about each tree in the farm and what their requirements are. The date farmer may hire help from outside the family. Indeed, many farms are run with the help of migrant workers who are taught how to work with the dates, but knowledge of pollination is kept within the family. When the farmer has pollinated the trees, continued Mohammed, the flowers will remain at the top of the tree. In late March/early April, the farmer will bring the stems of the flowers down, arranging them neatly around the trunk of the palm. Judging by his bemused face, I must have looked utterly confused at this point. It has never occurred to me that the neat circles of date bunches you see on date palms aren’t actually natural. Patiently, Mohammed continued his explanation, now supplemented with illustration photos and a drawing. Harvesting the dates when they hang around the trunk of the tree is safer for the farmer, he said. 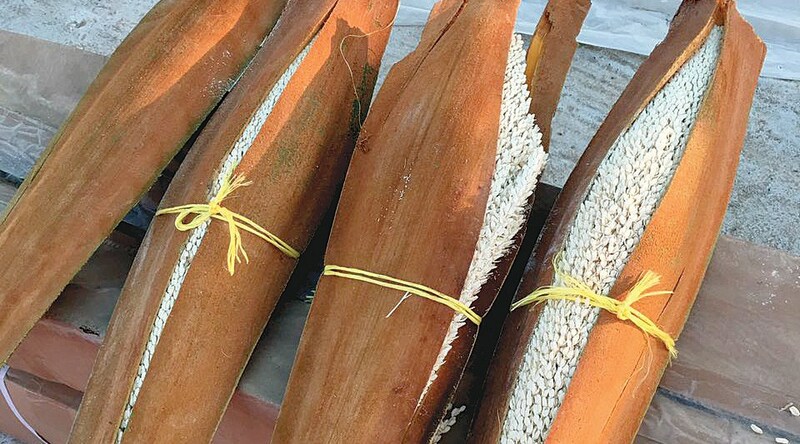 Also, leaving the stems in their natural position, pointing upwards, will provide good air circulation for the dates – but the farmer risks the dates being damaged by or lost to the wind. This process of bending down the stems has to be done early, while the branches are still young enough to be bent and shaped. While bringing down the stems, the farmer will evaluate the size of the harvest, calculate how much space there is on each tree, and prune as needed. With pollination done and date branches tied down in orderly bunches, the farmer waits for summer to arrive, shared Mohammed. 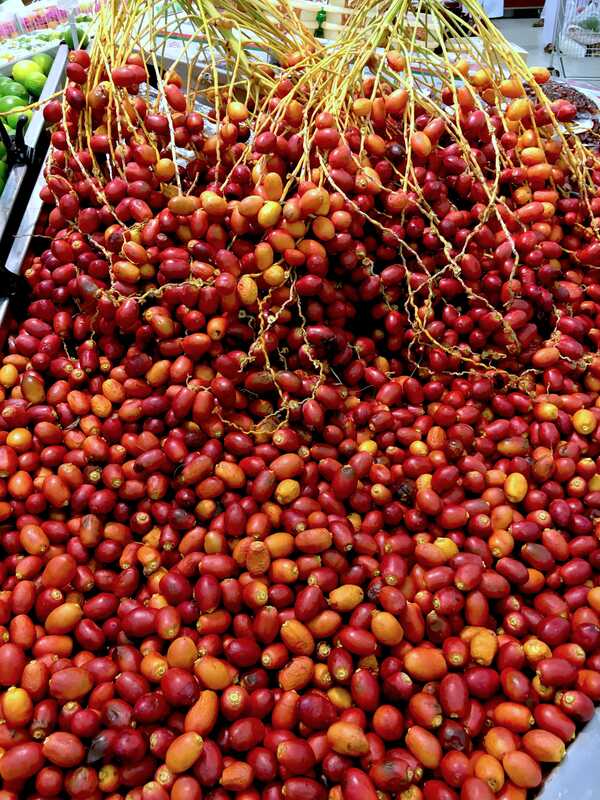 The date harvest stretches over three to four months and there are several different types of dates, the most popular in Oman being Khalas, Khunaizi and Fargh/Fard. The first dates, like Al Nagal and Ash Patash, are ready to be harvested early to mid May. 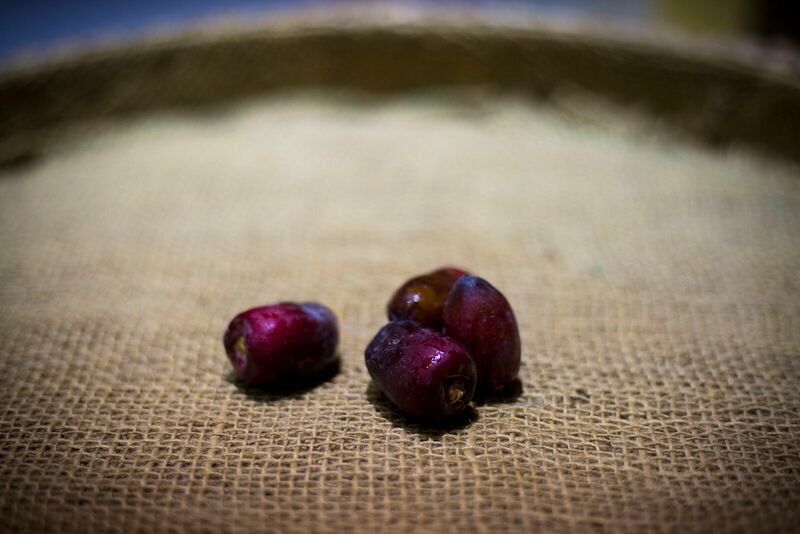 Their taste is not as sweet as that of different varieties harvested later in the season. The harvesting of Khalas, believed to be of the highest quality, starts towards the end of June and lasts for around one month while Khunaizi, another local favorite described as the most sugary in taste, is harvested slightly later. 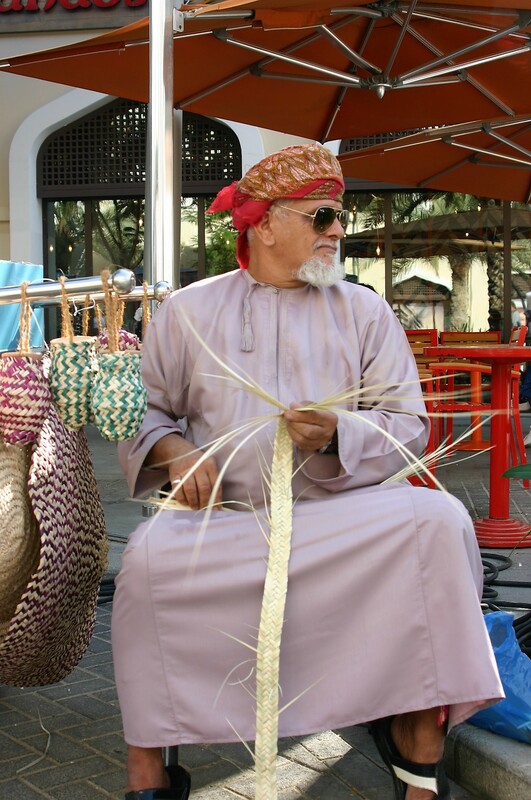 Some palms will carry fruit until September/October, said Mohammed, but these dates are often rather salty in taste. When the dates are ready, the farmer will climb the tree trunk using a rope traditionally made from dried palm leaves, and harvest the fruit. This process, like the pollination process before it, has to be done over time since not all dates ripen at the same time. When the dates have been picked from the palm three, they must be classified, Mohammed explained. This is a job for the family and Mohammed will either bring his family to Nizwa or bring the dates to Muscat for classification. 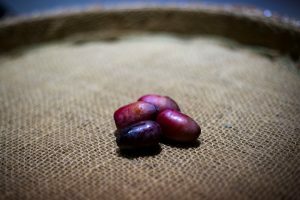 He thinks it is especially important that his children participate, so he can pass on his knowledge of dates to them, just as he himself learned from his father when he was a boy. 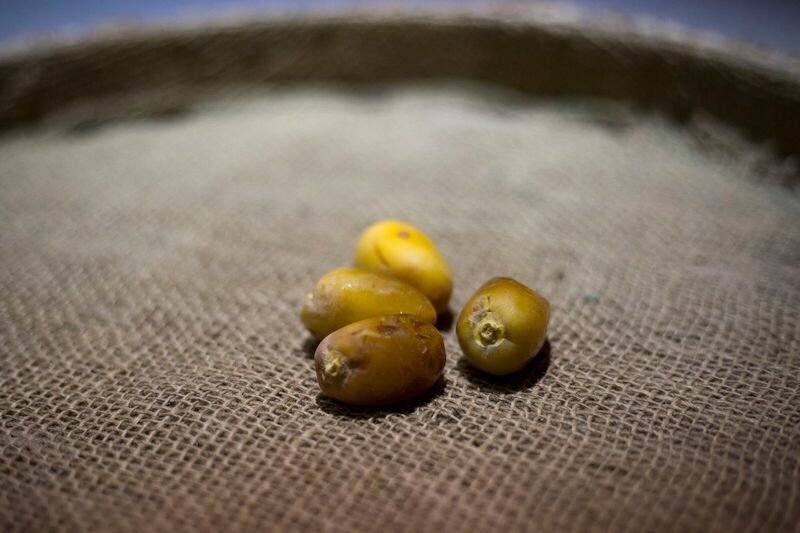 Dates are classified based on how they look; their color, their shape and their dryness, as well as how they feel. Dates still attached to the stem are deemed to be better than dates off the stem. Good quality dates are kept for eating; bad ones are used as animal fodder. The good dates, shared Mohammed, are eaten fresh, or washed and dried outside in the mid-day sun before they are packed for storage or for sale. The dates are dried on big mats made from washed and dried palm leaf fronds. 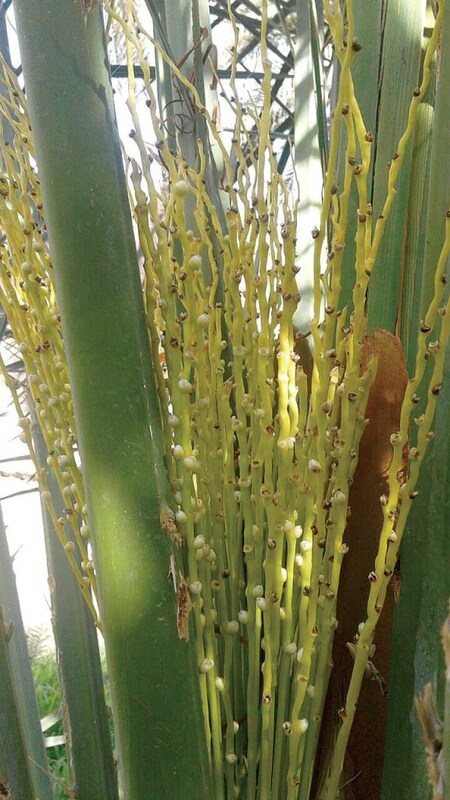 These fronds are also used to make baskets for storage and transportation. Family date farming – a way to use past knowledge to build a sustainable future? Oman is a country in rapid change, and many young people – like Mohammed – leave the family farm behind to earn a living in the city. The farms, as Mohammed shared, now often rely on migrant workers for everyday tasks. While agriculture makes up a mere fraction of Oman’s GDP today, the government hopes to increase this percentage, and Oman’s economic resilience with it. If being more self-sufficient as a food producer is a goal, I think it is important to retain knowledge of food production in the local population. Migrant workers in Oman are by definition transitory. They come and go, taking their knowledge with them. Family farms can be seen as an arena where factual knowledge of sustainable farming practices is reproduced.